The 2012-2013 Tolbachik Fissure eruption started from lava gushing and effusion in the Menyailov vent on November 27 th , 2012; after three days the activity of this vent ceased and the eruption continued from the Naboko vent until its end in September 2013. The eruption produced about 0.7 km 3 of high-Al basaltic trachyandesites (Dvigalo et al., 2014). 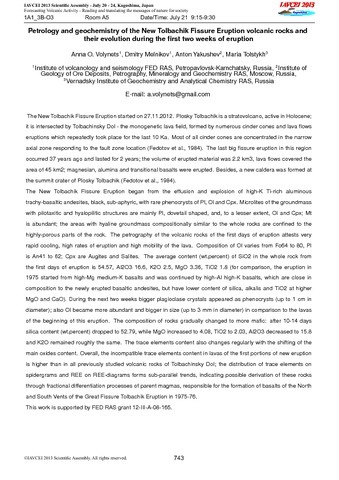 At Menyailov vent SiO2 concentrations were as high as 55.35 wt.% and K2O -2.67 wt.% -higher than in any previously erupted rocks in Tolbachik monogenetic area. From the beginning of December, SiO 2 concentration in lavas dropped by 2 wt.% and remained at this level until the end of eruption. MgO, TiO2, Mg# increased, K2O, Na2O decreased slightly. Most prominent change we observe in K2O/MgO ratio, which was about 0.7 in the Menyailov vent rocks and became 0.5 in the Naboko vent rocks. Details of the geochemical composition of the volcanic rocks produced by this eruption are reported elsewhere (Volynets et al., 2013, Volynets et al., 2014 a, b); here we present the results of the geochemical study of the main phenocrysts in the lavas – plagioclase. 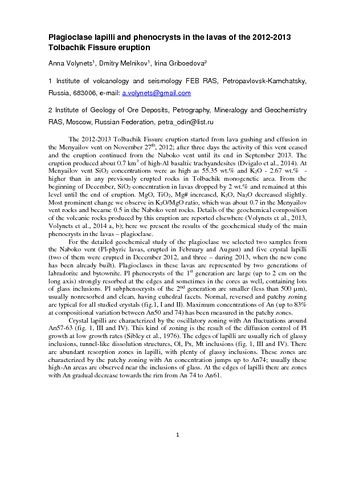 For the detailed geochemical study of the plagioclase we selected two samples from the Naboko vent (Pl-phyric lavas, erupted in February and August) and five crystal lapilli (two of them were erupted in December 2012, and three – during 2013, when the new cone has been already built). Plagioclases in these lavas are represented by two generations of labradorite and bytownite. Pl phenocrysts of the 1 st generation are large (up to 2 cm on the long axis) strongly resorbed at the edges and sometimes in the cores as well, containing lots of glass inclusions. Pl subphenocrysts of the 2 nd generation are smaller (less than 500 µm), usually nonresorbed and clean, having euhedral facets. Normal, reversed and patchy zoning are typical for all studied crystals (fig.1, I and II). Maximum concentrations of An (up to 83% at compositional variation between An50 and 74) has been measured in the patchy zones. Crystal lapilli are characterized by the oscillatory zoning with An fluctuations around An57-63 (fig. 1, III and IV). This kind of zoning is the result of the diffusion control of Pl growth at low growth rates (Sibley et al., 1976). The edges of lapilli are usually rich of glassy inclusions, tunnel-like dissolution structures, Ol, Px, Mt inclusions (fig. 1, III and IV). There are abundant resorption zones in lapilli, with plenty of glassy inclusions. These zones are characterized by the patchy zoning with An concentration jumps up to An74; usually these high-An areas are observed near the inclusions of glass. At the edges of lapilli there are zones with An gradual decrease towards the rim from An 74 to An61. Plagioclase lapilli and phenocrysts in the lavas of the 2012-2013 Tolbachik Fissure eruption. Volynets O.N., Flerov G.B., Andreyev V.N., Popolitov E.I., Abramov V.A., Petrov L.L., Shcheka S.A., Selivanova G.I. 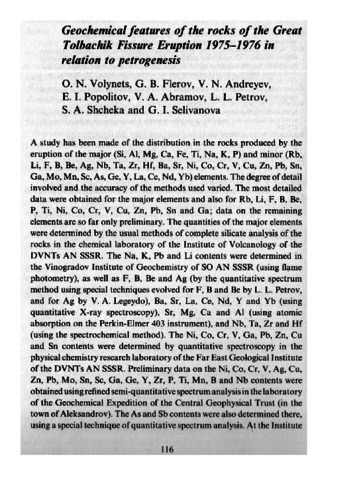 Geochemical features of the rocks of the Great Tolbachik Fissure Eruption 1975–1976 in relation to petrogenesis // The Great Tolbachik Fissure Eruption. Cambridge: Cambridge University Press. 1983. P. 116-140. This paper presents the results of studying the spatial distribution and structural setting of magnesian basalts and andesites in the Northern group of Kamchatkan volcanoes and in the junction zone of the Kuril-Kamchatka and Aleutian island arcs. 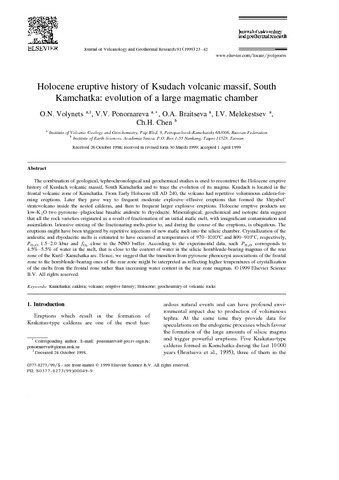 The morphology and geologic structure of unique Kamchatkan magnesian basalt stratovolcanoes are described: Kharchinsky, Zarechnyi, and the Kharchinsky regional zone of cinder cones. The reported evidence includes the ages and eruptive histories, and productivities of the volcanoes and the volumes and weights of their edifices. The magnesian basalts were erupted 40-50 thousand years ago, for the first time during the Holocene. Most of the Kharchinskii and Zarechnyi products, as well as those of the Kharchinskii cinder cones, are magnesian rocks. Mineralogical data suggest that both the basaltic and the andesitic magma were rich in water (≥3-4 and >6-7 wt., respectively) and crystallized at high oxygen fugacity (2.0-2.5 orders of magnitude higher than the NNO buffer). These features, coupled with the geochemical characteristics of these basalts and andesites, indicate that they are similar to the rocks of Shiveluch, a volcano also located on the northern flank of the Northern volcanic group, but differ from the rocks of the other volcanoes of this group which are located further south. The Kharchinskii, Zarechnyi, and Shiveluch magnesian basalts differ from the rocks of the Klyuchevskoi volcano and Tolbachik lava field by their higher K, Ba, Sr and lower Ca, Sc, Yb contents at higher La/Yb, Ni/Sc, and La/Ta ratios, while their initial magmas were more hydrous and more oxidized. The combination of geological, tephrochronological and geochemical studies is used to reconstruct the Holocene eruptive history of Ksudach volcanic massif, South Kamchatka and to trace the evolution of its magma. Ksudach is located in the frontal volcanic zone of Kamchatka. From Early Holocene till AD 240, the volcano had repetitive voluminous caldera-forming eruptions. Later they gave way to frequent moderate explosive–effusive eruptions that formed the Shtyubel' stratovolcano inside the nested calderas, and then to frequent larger explosive eruptions. Holocene eruptive products are low-K2O two pyroxene–plagioclase basaltic andesite to rhyodacite. Mineralogical, geochemical and isotopic data suggest that all the rock varieties originated as a result of fractionation of an initial mafic melt, with insignificant contamination and assimilation. Intensive mixing of the fractionating melts prior to, and during the course of the eruptions, is ubiquitous. The eruptions might have been triggered by repetitive injections of new mafic melt into the silicic chamber. Crystallization of the andesitic and rhyodacitic melts is estimated to have occurred at temperatures of 970–1010°C and 890–910°C, respectively, PH2O 1.5–2.0 kbar and fO2 close to the NNO buffer. According to the experimental data, such PH2O corresponds to 4.5%–5.5% of water in the melt, that is close to the content of water in the silicic hornblende-bearing magmas of the rear zone of the Kuril–Kamchatka arc. Hence, we suggest that the transition from pyroxene phenocryst associations of the frontal zone to the hornblende-bearing ones of the rear zone might be interpreted as reflecting higher temperatures of crystallization of the melts from the frontal zone rather than increasing water content in the rear zone magmas. 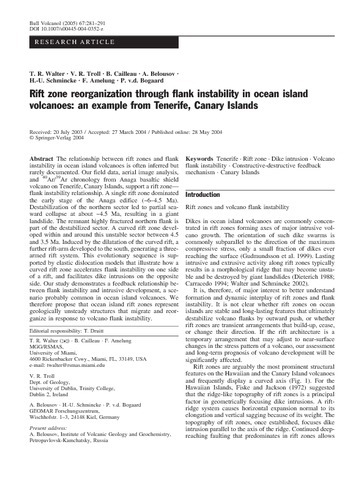 Walter T. R., Troll V. R., Cailleau B., Belousov A., Schmincke H.-U., Amelung F., Bogaard P. Rift zone reorganization through flank instability in ocean island volcanoes: an example from Tenerife, Canary Islands // Bulletin of Volcanology. 2005. V. 67. № 4. P. 281-291. doi:10.1007/s00445-004-0352-z. A large tectonic earthquake occurred on Kamchatka peninsular on New Year's Day of 1996 along a SW–NE trending fracture system. Just two days after the earthquake and at a distance of about 10–20 km to the north, a simultaneous eruption of two separate volcanoes followed. These were Karymsky Volcano and Akademia Nauk Volcano, the latter having its first eruption in historical records. In this paper I use numerical models in order to elaborate the static stress transfer between the earthquake and the volcanic system during the sequence that culminated in the January 1996 volcano-tectonic events. The models were designed to consider (i) the geodetically identified pre-eruptive period of doming in order to calculate stress changes at the nearby SW–NE trending fracture zone, and (ii) the January 1996 Mw 7.1 earthquake in order to calculate the dilatation and stress changes at the magma plumbing system. The results suggest that stress changes related to year-long inflation under the volcanic centers increased the Coulomb failure stress at the active faults and thus encouraged the earthquake. The earthquake, in turn, prompted dilatation at the magmatic system together with extensional normal stress at intruding N–S trending dikes. Also, field measurements confirmed the presence of N–S oriented fractures above the dike. Unclamping of the N–S oriented fractures allowed magma to propagate and eventually to trigger the twin-eruption at the volcanoes Karymsky and Akademia Nauk. These findings imply that successful hazard evaluations at volcanoes elsewhere require consideration of the seismo-tectonic framework and large earthquake cycles. The remote sub-arctic wilderness of Kamchatka contains a line of active volcanoes above the Pacific Ocean plate subduction zone. This guide is based on the itinerary of the 1999 GA excursion to sites around Petropavlovsk. Descriptions cover the Uzon caldera and its Valley of Geysers, and the volcanoes of Avacha, Karimsky, Gorely and Mutnovsky. 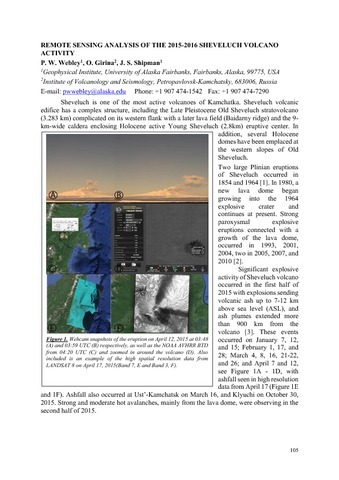 Webley P, Girina O.A., Shipman J Remote Sensing Analysis of the 2015-2016 Sheveluch Volcano Activity // 9th Biennial Workshop on Japan-Kamchatka-Alaska Subduction Processes (JKASP 2016). Fairbanks, Alaska: UAF. 2016. P. 105-106.